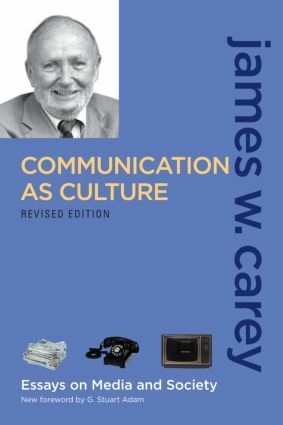 In this classic text, James W. Carey maintains that communication is not merely the transmission of information; reminding the reader of the link between the words "communication" and "community," he broadens his definition to include the drawing-together of a people that is culture. In this context, Carey questions the American tradition of focusing only on mass communication's function as a means of social and political control, and makes a case for examining the content of a communication—the meaning of symbols, not only the motives that originate them or the purposes they serve. He seeks to recast the goal of communication studies, replacing the search for deterministic laws of behavior with a simpler, yet far more challenging mission: "to enlarge the human conversation by comprehending what others are saying." This new edition includes a new critical foreword by G. Stuart Adam that explains Carey's fundamental role in transforming the study of mass communication to include a cultural perspective and connects his classic essays with contemporary media issues and trends. This edition also adds a new, complete bibliography of all of Carey's writings.